We're All on the Dole Now! Cash for Clunkers Overwhelming Success! Are TIPS in a Bubble? He was convicted in June of securities fraud for taking more than $5 million from about 180 investors for a payday lending business. Investors were promised a 15 percent monthly return. You can't even trust payday lending business operators to give you 15% monthly returns on your investments these days. Times really are tough. California officials say as many as 40,000 jobs could be lost after Toyota closes the plant in Fremont, Calif., where it builds the popular Corolla sedan and a small pickup, the Tacoma. And the U.A.W., which accused Toyota of callously abandoning its workers, criticized it for shifting Corolla production to Canada and Japan after millions of dollars in cash-for-clunkers rebates from the United States government caused sales of that car to surge. If a $3 billion Cash for Clunkers Program somehow ultimately helped Americans lose 40,000+ jobs then I suggest that we simply institute a reverse policy. A $3 billion Clunkers for Cash Program could theoretically create 40,000+ jobs! That's not all we could do though. When used together the two programs could become a monster success story. 1. Trade in your clunker for cash. 2. Use that cash to buy your clunker back. Long-term sustainable economic activity, that's what I'm talking about. That's not all. We can improve it. If we got the Banking System involved to add much needed leverage to the equation, just imagine how fast our GDP could grow! 1. Trade in your clunker for 30 times its value in cash (29/30ths is a loan). 2. Use 1/30th of your cash to buy your clunker back. 3. Use 1/30th of your cash to make minimum payments on the loan. 4. Use 28/30ths of your cash to buy consumer staples and discretionary items. 5. Repeat a few times! Gosh, I sure hope my math works out. I might be thinking a bit like a politician. You know, short-term knee jerk reactions based on back of envelope math calculations and a gut feeling that something needs to be done. My girlfriend has just been informed that she is the LAST person who will be receiving worker retraining in Washington State as part of the stimulus package at the college she will be attending. The state allots only so much per college and the funding at this particular community college has just run out. This college is the only one in the State of Washington that offers a degree in the program that she wishes to study. It seems the demand for paid worker retraining (thanks to rising unemployment) has exceeded supply. Her advisor said, "You should thank your lucky stars tonight because you're the last one." Future unemployment recipients will be required to fund their own education expenses from this point on. That might not be so easy (if the following article is any indicator). “Our business operations remain solid, with anticipated fiscal 2009 revenue down only by low single digits,” Chief Executive Officer Mary Berner said in today’s statement. She said Aug. 17 in an interview that Reader’s Digest may emerge from bankruptcy in 45 to 90 days. Business operations remain solid? Bankruptcy? These two phrases belong in the same paragraph? I'm experiencing serious reader's indigestion. Here's something I wrote last year. Keep in mind that this was written well before the stock market cratered. The DJIA closed that day at 12,720.23. I thought we were well on our way to becoming a banana republic then. Just imagine what I'm thinking now. “Nothing can stop prices from falling now, given that demand has deteriorated so much,” said Masaaki Kanno, a former central bank official and now chief economist at JPMorgan Chase & Co. in Tokyo. “Consumer-price declines threaten to squeeze corporate profits because material costs are edging up” and companies are unable to pass them onto customers, he said. I remain braced for deflation AND inflation as best I can. You may note that my short-term inflation mood (as seen in the upper left corner of my blog) remains neutral (roughly 0% overall inflation). It almost seems permanently stuck there. TIPS (treasury inflation protected securities) offer some inflation protection AND some deflation protection. On the inflation side, their value tracks the CPI (consumer price index) while offering additional interest payments. On the deflation side, bonds bought today will will pay at least face value upon maturity (just like buried cash would if held for the full duration). This isn't investment advice. It's simply an observation. If you believe that our economy and our standard of living cannot stand the strains being imposed on it long-term such as I do, then a "Not Losing" investment strategy may just beat the historically highly leveraged "Gamble More" strategy. I will grant you that the latter strategy worked out exceptionally well from 1980 to 2000. However, the former strategy has been the clear winner since 2000 (and that includes the most recent stock market rally). Earlier this year, the governor signed a budget proposal that included more than $10 billion in temporary tax hikes to help erase the state's colossal deficit. That's probably worth reading twice too. The government gets first dibs on any extra money the tapped out consumer may be holding. There are roughly 37 million people in California. $10 billion represents $270 per man, woman, and child. It is also worth mentioning that California's unemployment rate is currently a whopping 12.1%. A good chunk of those men, women, and children don't have jobs to pay those additional taxes. The additional "temporary tax hikes" represent $810 to a family of three. That's a high end washing machine. No worries. China has that missing demand covered. From the excesses now seen in the Chinese economy, that meltdown appears now to be impending. Companies have more liquid assets than they can usefully invest and have been gambling with them in the stock market, a phenomenon last seen in size in Japan in the late 1980s. Shipments to retailers have increased by 15% in the first half of 2009, an increase reflected in the gross domestic product statistics but not necessarily in sales to final consumers, although households without electricity or running water have reportedly been dragooned into buying washing machines. The elephant in the room in the major public policy debates in Congress is not the GOP, but the growing federal deficit and it is getting harder and harder for both parties to ignore. New projections released Monday show that elephant is getting bigger and bigger. It is based on the idea that an elephant in a room would be impossible to overlook; thus, people in the room who pretend the elephant is not there might be concerning themselves with relatively small and even irrelevant matters, compared to the looming big one. In terms of kills per loss, the Ferdinand/Elefant might well have been the most successful tank destroyer employed during the war, reaching an average ratio of approximately 10:1. Perhaps the Elefant could stop some of the "tanking"? It wouldn't be the first time that a country turned to war once their economy fell apart. Coming up on the fifth anniversary of the invasion, a Nobel laureate now estimates that the wars in Iraq and Afghanistan are costing America more than $3 trillion. So where's the optimism you might ask? But it's not all gloom and doom, believe it or not. Stimulus binges? Roller coaster equity performance over years? Stubborn consumers holding out for sales as deflationary pressures loom over the recovery? Sounds like the U.S. economy is turning Japanese, Davidowitz says. China plunged another 5.8% overnight adding to the 12% we've been waving the flag over the past few weeks. So let's see if US computers can pretend the rest of the world doesn't exist for yet another day. Somehow I doubt it although we'll always have the post 3:30 PM period to paint lipstick on the pig. SHANGHAI (Dow Jones)--China's most-watched share index has tumbled 16% over the past two weeks but analysts say this doesn't mean the party is over, largely because Beijing probably doesn't want it to be. Probably doesn't want the party to be over? Probably? That's got to be one of the funniest things I've read in a long time. News flash! NOBODY wants the party to be over. At some point, the party always ends though. Go figure. The Shanghai Composite Index fell as much as 5.1 percent and declined 20.5 percent from this year’s high in August. Copper climbed 94 percent this year as China rolled out a 4 trillion-yuan ($585 billion) stimulus before new bank loans fell in July. Here's yet another trip down memory lane. Why this bubble in China? Wei Jianing, an economist at the Development Research Center of the State Council, estimates that 20% of the unprecedented amount of credit banks have extended during the first half of the year has found its way into the stock market. For the BBMG IPO, Hang Seng Bank offered margin loans at a record low rate of 0.5%. 0.5% margin loans should do wonders for their economy long-term, especially once everyone starts doing it. That was the theory anyway. The company says broader underlying demand for its products is consistent and increase, as consumer and supermarkets alike focus on more fresh produce. But the current economic downturn has affected the company: net revenue declined 11% to $3.3 billion in the six months ended June 20, and net income fell 18% to $123 million compared with the same period a year ago. Behold the "broader underlying demand"! Gasp at how "consistent" the net revenue is increasing! Step right up folks. Every investor can be a winner! On a financial level, the company is loaded with debt -- about $2.06 billion -- and warns that it may not be able to generate sufficient cash flow to service its loans. That's where I come in. I'm writing a check right now for $7. Pay to the order of "Goldman Sachs Group Inc., Bank of America Corp.'s Bank of America Merrill Lynch unit, Deutsche Bank AG and Wells Fargo & Co.'s Wells Fargo Securities". That's who is managing the IPO. With so many banking cooks in the kitchen, the investment is sure to be a smashing success! Why $7? That's what each and every American (all 304 million of us) would need to pay in order to completely clean the balance sheet of this company "loaded with debt" (all $2,060,000,000 of it). Heck, we'd even have $68 million left over to throw the executives one heck of a toga party! In order for young companies to grow, they must have ample capital on hand to expand the business and take care of daily operations. For most companies, this means resort to the debt markets as a means of getting the necessary capital. There is nothing wrong with this, and it is a trademark of our vibrant economy that such a market exists. However, too much debt can crush a company. Something went wrong with our vibrant economy's debt markets. Oops! Further, is it just me or is Dole not really a young company? It is just now going public again though. I guess that's something. The company traces its origin to the 1851 establishment of Castle & Cooke by missionaries Samuel Northrup Castle and Amos Starr Cooke. Castle & Cooke rapidly became one of the largest companies in Hawaii, investing in shipping, railroad construction, sugar production, and seafood packing. The other half of Dole's corporate heritage, The Hawaiian Pineapple Company, was founded in 1901 by James Dole, who opened his first pineapple plantation in the central plateau of the Hawaiian island of Oahu. The company plans to use the offering's proceeds to pay off some debt, with any remaining funds used for general corporate purposes. The transaction continues a recent trend of companies being taken private by their executives as stock valuations have fallen. Typically, the executives look to fix the company's balance sheet outside of the market's glare and return to the public markets once valuations improve. 1. If executives like to take companies private when stock valuations have fallen, then using that logic in reverse what would make executives want to take companies public? Fat and juicy stock valuations? You never see that in the news though. Go figure. 2. Apparently that whole "fix the company's balance sheet outside of the market's glare" idea was completely bogus! Color me surprised! Sort of, well, er, not really I guess. The worst recession since the 1930s has created a reservoir of demand that will buoy the economy, say a growing number of economists led by James Glassman at JPMorgan Chase & Co., former Federal Reserve Governor Laurence Meyer and Stephen Stanley at RBS Securities Inc.
“Whenever we have plunged off a cliff and fallen into a deep hole in the past, for a while the economy has a tendency to bounce back very quickly,” said Glassman, a senior economist at JPMorgan in New York. Glassman and his colleagues this month said forecasts of 3 percent to 4 percent growth in coming quarters may be too low given “pent-up” consumer demand. I asked my unemployed girlfriend how much "pent-up" consumer demand she had and her answer somewhat contradicted the opinion of James Glassman. Her "reservoir" appears mostly empty. Go figure. I therefore offer you this glimpse down memory lane to see how at least one of his previous predictions panned out. "If there is any further decline at this point, it will probably be very marginal," predicted Lawrence Yun, chief economist of the National Association of Realtors, an industry trade group. He noted the index had shown stability even after credit markets seized up in August. If pending home sales are stabilizing, that would imply that existing home sales will begin to steady soon and there will be less need in the future for builders to cut back, Yun said. James Glassman, an economist at JPMorgan in New York, agrees with Yun that the downturn in the housing sector appears to be nearing a bottom. "Even if housing just stabilizes, the damage to the economy will start to ease," he said. For the record, hindsight shows the DJIA is STILL down 25% from that day, we'd actually entered the recession one month earlier, AND last but certainly not least we're STILL looking for housing to stabilize (over a year and a half later)! Other than that, his predictions were right on the money. Hahaha! Even so, stabilization of the hard-hit housing market, which is seen as key to an economic recovery in the United States, is not yet in view, with mounting foreclosures and a high level of "underwater" mortgages still posing threats, Zillow said. Building on a months-long trend that analysts say is a sign of improved health in the housing market, existing home sales surged by 75 percent in Miami-Dade and 35 percent in Broward as steep price declines, low interest rates and tax incentives continue to drive demand. Prices down on extremely high volume? That would be considered a panic on Wall Street's stock market, but in the wacky realm of real estate it is apparently considered a "sign of improved health". Who knew! LAHORE: Revenue officials backed by police raided sugar mills and godowns across Punjab on Friday and seized hundreds of thousands of hoarded sugar bags. The raids began after Chief Minister Shahbaz Sharif ordered a crackdown on sugar hoarders and said that their stocks be brought into the market in 24 hours and sold at fixed prices.. I think I'm onto something here. This is pure snow. It's everywhere. Have you any idea what the street value of this mountain is? "Long-term prosperity for the U.S. overall will continue to derive from the effectiveness and integrity of its political institutions, prudent regulatory and trade policies, the innovation of entrepreneurs, and the freedom of citizens to choose the course of their lives," according to Dr. William Inboden, Senior Vice President of the Legatum Institute. "True prosperity consists of more than money," Dr. Inboden continued. "It also includes happiness, health, and liberty. If that's the definition of "true prosperity" then let's see how we are doing. Between 1996 and 2005, the rate of antidepressant treatment increased from 5.84 percent to 10.12 percent or from an estimated 13.3 million to 27 million individuals. Of course, passengers could always complain: after all, the First Amendment to the Constitution guarantees freedom of speech, which means that passengers should, in concept, be able to voice their grievances. However, a broad application of the Patriot Act has, effectively, suspended freedom of speech on airplanes. A particularly powerful example of this is the case of Nicola Cantisani, a blind interpreter who was dragged off an airplane in (ironically) Philadelphia, imprisoned without food and water, and denied access to legal representation after he questioned flight personnel about a two hour delay. While Cantisanti's story is an extreme example, the plethora of similar tales suggests that customers who question their treatment do so at their own peril. I search for him every week or so and he's made another appearance. What he is describing is the potential for more 1970s inflationary style activity followed by more Great Depression deflationary style activity, and that is something the global markets have almost completely ruled out. In other words, round two of what we've already experienced in recent years. Based on those two paragraphs alone, I think you can see why I am a paper stagflationist long-term (in TIPS). I'm scared of hard assets but I'm also scared of inflation. I'm trying to ride that fuzzy middle ground in between the two. It served me rather well during the last inflationary/deflationary cycle overall and it did not require market timing. My goal is not to profit off of our demise, but simply to not be dragged down with it. Please read it all. You'll be glad you did, even if you don't agree with it. I also want to take you back to some of Andy Xie's previous predictions (especially as it relates to his well timed Chinese prediction on April 30, 2007). I don't look to him so much for advice, as I do as a sanity check in a world gone mad. The ``cash for clunkers'' program is an overwhelming success, not just in my opinion but in the opinion of the people on the street. This may be the only recognizably successful part of the stimulus program to date. There are 300 million people in this country. The original "cash for clunkers" program used just one billion dollars. If it was the only recognizably successful part of the stimulus program to date, then we managed to avert the Great Depression with $3.33 of stimulus for every man, woman, and child. Just think where we'll be once the program's been tripled to $10 per person. At $10 per person, that's like borrowing 30 minutes of wages ($18.56 average hourly wages according to latest government figures) from each American's future (preferably from those who can actually find work) so that we can give some Americans $4,500 right now. Why was I ever bearish? Watch out China! Here we come! Stop your nitpicking! We can simply triple the size of the program each time it runs out of money and/or appears to be stalling! Even with an increase, TIPS would remain a fraction of the overall market for Treasurys. 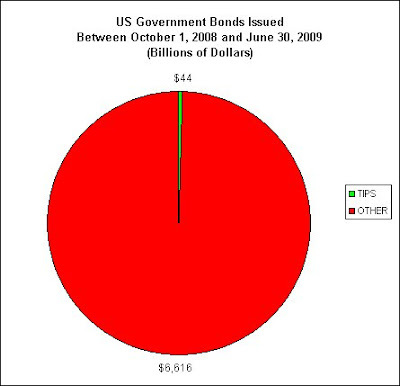 Of the $6.66 trillion of government bonds issued between Oct. 1, 2008 and June 30 of this year, just $44 billion were TIPS. All things being equal, it seems 150 investors bought regular bonds for each investor who bought TIPS. I suddenly feel very lonely. I was one of those investors in the latter group. Put another way, if the government bond market sales were represented by a full gallon of milk (128 ounces) during the period, then TIPS could be represented by less than a single one ounce shot glass of Bacardi Rum. I might be wrong, but I suspect that the $0.044 trillion invested in TIPS in the 9 months ended June 30th does not adequately describe the size needed for a serious American-style investment bubble. Those remaining $6.616 trillion of government bonds might qualify though. Only time will tell! For those having a problem with my Bacardi Bottle Rocket analogy, here's a more serious chart. Just look at all that incentive to keep long-term inflation in check. I have no doubts that the inflation protected TIPS market can fend off serious inflation all by itself! By the way, 10% inflation would require $4.4 billion just to pay the adjusted principal on those TIPS in the chart. $4.4 billion in a year sure rings a bell. That's scary huge! It's sending me right back down memory lane. Banks and dealers' overall direct borrowings from the Fed averaged a record $437.53 billion per day in the week ended October 15, topping the previous week's $420.16 billion per day. Oops. What I was remembering was 100 times bigger and it was per day, not per year. Nevermind. I temporarily forgot that the new math for the new economy means that anything 4.4 times bigger than an original "cash for clunkers" program is actually chump change, and is therefore likely to simply get lost in some politician's couch. 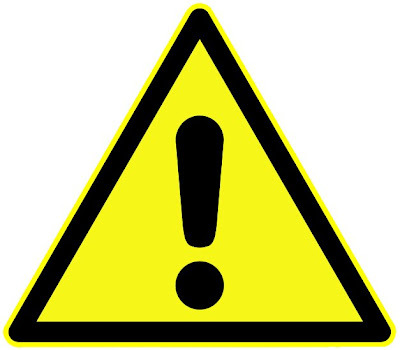 On warning signs, an exclamation mark is often used to draw attention to a warning of danger, hazards and the unexpected. It is normally supplied with a note, as it is a generic term. At a press conference, Treasury Deputy Assistant Secretary for Federal Financing Matt Rutherford noted that demand for TIPS is swelling. We continue to hear growing demand for the product," he told reporters. If long-term inflation expectations were well anchored, then why would demand for inflation protection be swelling and why would the Treasury continue to hear growing demand for its inflation protected products? In a briefing with reporters today, Matthew Rutherford, the Treasury’s deputy assistant secretary for federal finance, said the government remains committed to reducing the budget shortfall. Remains committed? It looks to me like the government's version of "committed" is related to the "mental institution" definition. As an example, what would you call your neighbor if he told you he was committed to getting his finances in order but spent each weekend borrowing more money from China? What if I told you he was buying clunkers for $4500 each? What if I told you he was destroying the cars he bought with a giant sledge hammer? What if I told you that it was the most financially responsible thing he's done yet to deal with his debt crisis? His previous attempts included handing money directly to bankers so that they could continue to give themselves large bonuses! The department is hearing growing interest for TIPS, he said, declining to comment about any potential purchases by China or other individual buyers. He did not specifically mention me? Hahaha! Can you imagine what the markets would do if he did? Um, yeah. Okay. There's been some demand from this guy who is worried about the future of our country. He apparently runs an Illusion of Prosperity blog and has stagflationary in his name. He's got the vast majority of his nest egg in TIPS and I-Bonds. Funny thing is he did this before the credit crisis even hit. It's almost like he suspected that something very bad was going to happen. Yet, we know that is impossible because nobody could see it coming. Dudley acknowledged that there are some risks inherent in the Fed's strategy, including that it could unhinge inflation expectations, but he said the Fed is monitoring these risks and sees no danger signs yet. Here's a chart of what the Fed sees. Note that I used an exponential trend line starting from the point the price of oil bottomed late last year, that the trend line is curving upwards, and that today's price of oil got a nice boost over the weekend (not seen in the chart, bringing it nearly all the way back to the trend line). Economic oil spill on the horizon? Hembre said that it seems that oil prices are rising more as a result of investors being willing to take on more risk as opposed to actual changes in fundamentals. Well, why wouldn't investors take on more risk? The Fed hasn't spotted any danger signs yet. Hahaha! For what it is worth, I'd be one nervous oil trader right now if I was long. 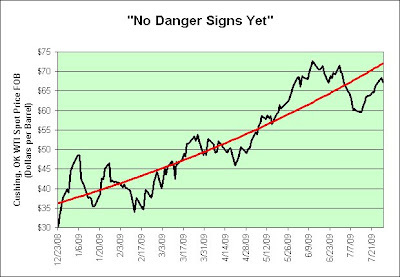 We know what happens when the Fed finally sees danger signs. Those trying to milk every last penny out of a parabolic rise tend to panic right along with them. D'oh! WASHINGTON — Federal Reserve Chairman Ben Bernanke Friday said that battling the worst financial crisis to hit the United States since the 1930s has "dominated my waking hours" for the last 21 months. The temptation is to panic. But that is the worst possible thing to do as it is just fueling more selling and a sense of impending doom. Just look at what's happened with the banking sector.